Between 1933 and 1940, camel ­corps officer Lieutenant Brenans of the French Foreign Legion completed a series of small sketches and hand­ written notes detailing his discovery of dozens of rock art sites deep within the canyons of the Tassili n’Ajjer. Tassili n’Ajjer is a difficult to access plateau in the Algerian section of the Sahara Desert near the borders of Libya and Niger in northern Africa (see map below). Brenans donated hundreds of his sketches to the Bardo Museum in Algiers, alerting the scientific community to one of the richest rock art concentrations on Earth and prompting site visits that included fellow Frenchman and archaeologist Henri Lhote. Lhote recognized the importance of the region and returned again and again, most notably in 1956 with a team of copyists for a 16­ month expedition to map and study the rock art of the Tassili. Two years later Lhote published A la découverte des fresques du Tassili. The book became an instant best­-seller, and today is one of the most popular texts on archaeological discovery. 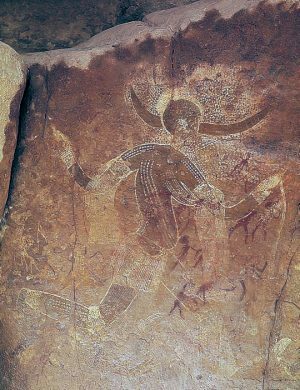 Lhote made African rock art famous by bringing some of the estimated 15,000 human figure and animal paintings and engravings found on the rock walls of the Tassili’s many gorges and shelters to the wider public. Yet contrary to the impression left by the title of his book, neither Lhote nor his team could lay claim to having discovered Central Saharan rock art: long before Lhote, and even before Brenans, in the late nineteenth century a number of travelers from Germany, Switzerland, and France had noted the existence of “strange” and “important” rock sculptures in Ghat, Tadrart Acacus, and Upper Tassili. But it was the Tuareg—the indigenous peoples of the region, many of whom served as guides to these early European explorers—who long knew of the paintings and engravings covering the rock faces of the Tassili. Tassili n’Ajjer is a Tamahaq name meaning “plateau” of the Ajjer people (the Kel Ajjer is group of tribes whose traditional territory was here). Much of the 1,500-­2,100 meter ­high plateau is protected by an 80,000 square kilometer National Park. Perhaps we have here the figure of a priestess of some agricultural religion or the picture of a goddess of such a cult who foreshadow—or is derived from—the goddess Isis, to whom, in Egypt, was attributed the discovery of agriculture. In other paintings found a few days later in the same massif we were able to discern, from some characteristic features, an indication of Egyptian influence. Some features are, no doubt, not very marked in our ‘White Lady’; still, all the same, some details as the curve of the breasts, led us to think that the picture may have been executed at a time when Egyptian traditions were beginning to be felt in the Tassili. Time and scholarship would reveal that the assignment of Egyptian influence on the Running Horned Woman was erroneous, and Lhote the victim of a hoax: French members of his team made “copies” of Egyptionized figures, passing them off as faithful reproductions of authentic Tassili rock wall paintings. These fakes were accepted by Lhote (if indeed he knew nothing of the forgeries), and falsely sustained his belief in the possibility of foreign influence on Central Saharan rock art. Breuil’s theories were likewise discredited: the myth of the “White Lady” was rejected by every archaeologist of repute, and his promotion of foreign influence viewed as racist. Yet Breuil and Lhote were not alone in finding it hard to believe that ancient Africans discovered how to make art on their own, or to have developed artistic sensibilities. Until quite recently many Europeans maintained that art “spread” or was “taken” into Africa, and, aiming to prove this thesis, anointed many works with Classical­ sounding names and sought out similarities with early rock art in Europe. Although such vestiges of colonial thinking are today facing a reckoning, cases such as the “White Lady” (both of Namibia and of Tassili) remind us of the perils of imposing cultural values from the outside. While we have yet to learn how, and in what places, the practice of rock art began, no firm evidence has been found to show that African rock art—some ten million images across the continent—was anything other than a spontaneous initiative by early Africans. Scholars have estimated the earliest art to date to 12,000 or more years ago, yet despite the use of both direct and indirect dating techniques very few firm dates exist (“direct dating” uses measurable physical and chemical analysis, such as radiocarbon dating, while “indirect dating” primarily uses associations from the archaeological context). In the north, where rock art tends to be quite diverse, research has focused on providing detailed descriptions of the art and placing works in chronological sequence based on style and content. This ordering approach results in useful classification and dating systems, dividing the Tassili paintings and engravings into periods of concurrent and overlapping traditions (the Running Horned Woman is estimated to date to approximately 6,000 to 4,000 B.C.E.—placing it within the “Round Head Period”), but offers little in the way of interpretation of the painting itself. Who was the Running Horned Woman? Was she indeed a goddess, and her rock shelter some sort of sanctuary? What does the image mean? And why did the artist make it? For so long the search for meaning in rock art was considered inappropriate and unachievable—only recently have scholars endeavored to move beyond the mere description of images and styles, and, using a variety of interdisciplinary methods, make serious attempts to interpret the rock art of the Central Sahara. Lhote recounted that the Running Horned Woman was found on an isolated rock whose base was hollowed out into a number of small shelters that could not have been used as dwellings. This remote location, coupled with an image of marked pictorial quality—depicting a female with two horns on her head, dots on her body probably representing scarification, and wearing such attributes of the dance as armlets and garters—suggested to him that the site, and the subject of the painting, fell outside of the everyday. More recent scholarship has supported Lhote’s belief in the painting’s symbolic, rather than literal, representation. As Jitka Soukopova has noted, “Hunter- gatherers were unlikely to wear horns (or other accessories on the head) and to make paintings on their whole bodies in their ordinary life.” Rather, this female horned figure, her body adorned and decorated, found in one of the highest massifs in the Tassili—a region is believed to hold special status due to its elevation and unique topology—suggests ritual, rite, or ceremony. 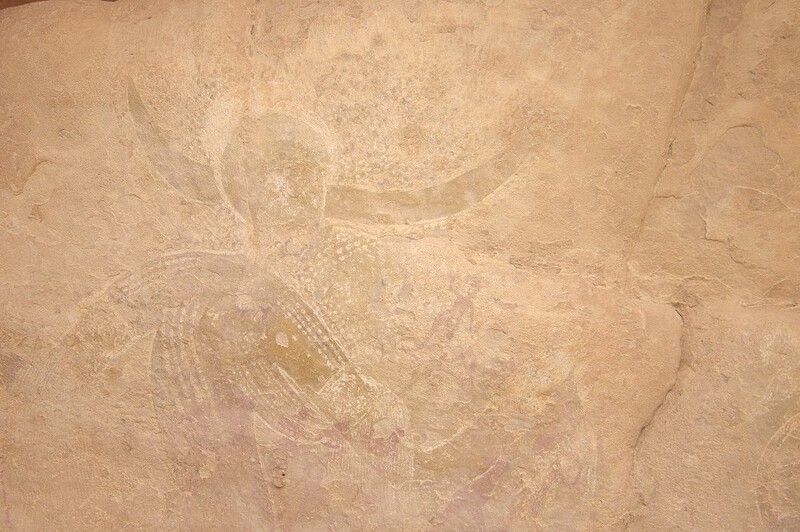 Rather, this female horned figure, her body adorned and decorated, found in one of the highest massifs in the Tassili—a region is believed to hold special status due to its elevation and unique topology—suggests ritual, rite, or ceremony. But there is further work to be done to advance an interpretation of the Running Horned Woman. Increasingly scholars have studied rock shelter sites as a whole, rather than isolating individual depictions, and the shelter’s location relative to the overall landscape and nearby water courses, in order to learn the significance of various “rock cities” in both image ­making and image ­viewing. Archaeological data from decorated pottery, which is a dated artistic tradition, is key in suggesting that the concept of art was firmly established in the Central Sahara at the time of Tassili rock art production. Comparative studies with other rock art complexes, specifically the search for similarities in fundamental concepts in African religious beliefs, might yield the most fruitful approaches to interpretation. In other words, just as southern African rock studies have benefitted from tracing the beliefs and practices of the San people, so too may a study of Tuareg ethnography shed light on the ancient rock art sites of the Tassili. 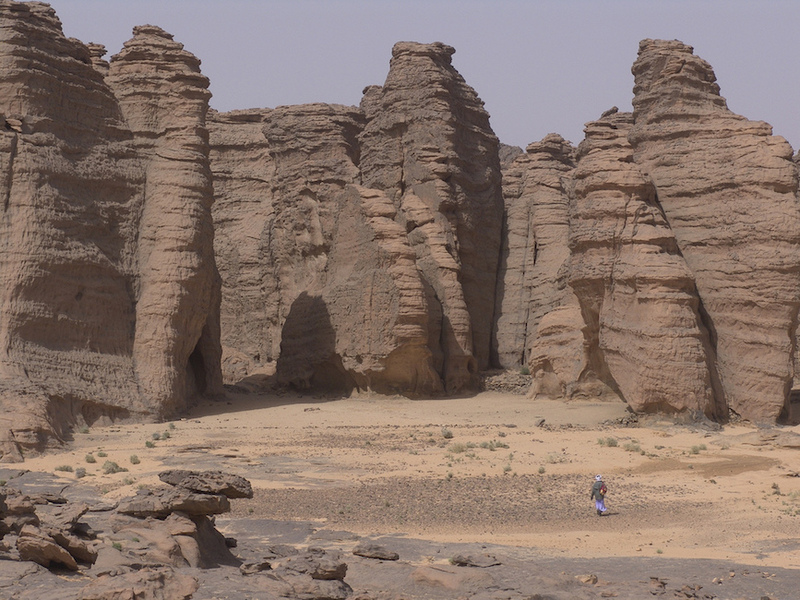 Tassili’s rock walls were commonly sponged with water in order to enhance the reproduction of its images, either in trace, sketch, or photograph. This washing of the rock face has had a devastating effect on the art, upsetting the physical, chemical, and biological balance of the images and their rock supports. Many of the region’s subsequent visitors—tourists, collectors, photographers, and the next generation of researchers—all captivated by Lhote’s “discovery”—have continued the practice of moistening the paintings in order to reveal them. Today scholars report paintings that are severely faded while some have simply disappeared. In addition, others have suffered from irreversible damage caused by outright vandalism: art looted or stolen as souvenirs. In order to protect this valuable center of African rock art heritage, Tassili N’Ajjer was declared a National Park in 1972. It was classified as a World Heritage Site by UNESCO in 1982 and a Biosphere Reserve in 1986. Jitka Soukopova, “The Earliest Rock Paintings of the Central Sahara: Approaching Interpretation,” Time and Mind: The Journal of Archaeology, Consciousness and Culture 4, no. 2 (2011), p. 199. David Coulson and Alec Campbell, African Rock Art: Paintings and Engravings on Stone (New York: Harry N. Abrams, Inc., 2001). David Coulson and Alec Campbell, “Rock Art of the Tassili n Ajjer, Algeria.” Adoranten, no. 1 (2010), p. 1­15. Jeremy H. Keenan, “The Lesser Gods of the Sahara.” Public Archaeology 2, no. 3 (2002), pp. 131-50. Jean ­Dominque Lajoux, The Rock Paintings of Tassili, translated by G. D. Liversage (London: Thames and Hudson, 1963). Henri Lhote, The Search for the Tassili Frescoes, translated by Alan H. Brodrick (London: Hutchinson & Co., 1959). Jitka Soukopova, “The Earliest Rock Paintings of the Central Sahara: Approaching Interpretation,” Time and Mind: The Journal of Archaeology, Consciousness and Culture 4, no. 2 (2011), pp. 193­-216. Cite this page as: Nathalie Hager, "Running Horned Woman, Tassili n’Ajjer, Algeria," in Smarthistory, April 30, 2016, accessed April 22, 2019, https://smarthistory.org/running-horned-woman-tassili-najjer-algeria/.